It is the mission of this Bureau to provide a fire safe community for our citizens and visitors. We maintain a proactive fire prevention program by inspecting all public buildings for potentially risk during an emergency event. We believe that effective fire prevention begins with education. Therefore we place a high priority on educating our community on the importance and purpose of fire safety. We believe it is a team effort that benefits us all when we are successful in reaching our goal of making West Jackson a fire safe District. The Fire Prevention Bureau conducts all fire and life safety code enforcement activities through building plans examination and on-site fire inspections. Fire inspectors are trained and certified through national certification processes to determine code violations and offer remedies to those violations. Fire and life safety codes are adopted mostly at the state level, although there are some local ordinances that are stricter than adopted state codes. Fire inspectors use these codes and ordinances to ensure that public buildings are safe when occupied, and, that should an emergency occur, occupants can safely escape without injury or death. 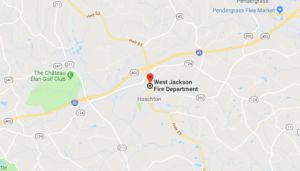 The West Jackson Fire Department Fire Prevention Bureau is charged with enforcing “Rules and Regulations for the State Minimum Fire Safety Standards” as adopted by the State Fire Commissioner. These responsibilities are established in Title 25 Chapter 2 of the Official Code of Georgia, and Rules and Regulations of the Safety Fire Commissioner Chapter 120-3-3. Here are some frequently ask questions. When did these inspections start? The Bureau was established November 2014. Since then it has focused on newly constructed buildings and new tenants moving in to an existing structure. Staring in 2017, the Bureau will inspect all buildings and structures in the District. Our main focus when performing these inspections is Life Safety. Click here for a printable list that provides an overview of items that should be addressed prior to the inspection, with an opportunity to correct any deficiencies that may exist. The checklist is not all inclusive as some businesses will require other items above and beyond what is on the list. Who will be making the fire inspection at my business? Uniformed firefighters with specialized training. They have expertise in preventing fires, enforcing the codes, and know first-hand how fires endanger lives and property. They sometimes ask other specialists, such as Building or Electrical Inspectors to assist them on some matters. In order to provide a high level of fire and life safety to the public. The goal of the Bureau is to inspect all public and commercial buildings annually. If a suspected fire or life safety hazard is reported to the Bureau, then an inspection could come sooner. It depends on several factors such as building size and uses. The inspection fee is based on the following two factors: square footage and the occupancy classification. If violations are found and cannot be immediately corrected, a re-inspection of the premises would be in order. There is no fee for the first re-inspection. However, if violations are not corrected a second re-inspection of the premises will be required and the inspection fee will be billed again. For more information click here. Currently the only form of payment accepted is check, money order, or online credit card. No cash. I pay property taxes, so why will I get a bill for my fire inspection? The Fire Board of the West Jackson Fire District elected to charge fees rather than raise taxes. The costs of the inspections are benchmarked with other Georgia Cities. These fees offset the cost to operate the Bureau. Who decides how much of a fire inspection fee to charge? Each year the Chief of the Fire Department and Fire Inspectors review the fees. They make recommendations and suggest changes in the fee structure. These adjustments are presented to the Fire Board, who make the final decision. Is this my landlord’s bill, because I don’t own the building? The State law requires the use of the building to be inspected; therefore, we bill the business we inspect. You may have a lease that makes the building owner responsible for certain items. This is a matter left up to you and the owner. We try to give all businesses the same re-inspection time span of a couple of weeks. We realize some things cannot be done in that time frame, and we will come by to just check on your progress as a reminder and see if you need any technical assistance. What happens if I do not fix my fire code violations? We will try to see if you just didn’t understand what was required and try to help you. However, fire code violations endanger you, your business, and the public. Violations have significant repercussions when left uncorrected. Georgia State law also provides for both civil monetary penalties and possible criminal charges. We would prefer to work with you, so that these actions are not needed.